A traditional and magical festival will take place next June 29 in Mexcaltitan, a northern Riviera Nayarit fishing village, that every year celebrates the island’s patron saints: San Pedro and San Pablo. Teams representing the saints will engage in a battle, and the winner will most likely St Peter, who is known as the cornerstone of the Catholic Church. They may be a little too heavy at times, but they’re in no way cheating. That's what the people say in Mexcaltitan, this town which could be the mythical starting point for the pilgrimage of the Nahuatl tribes in search of Tenochtitlan. Since the arrival of the Spanish and evangelization, this small island lost in wetlands has honored both apostles. And even if the Huitchilopoztli God ever commanded its people to undertake a pilgrimage in search of an eagle – or for more realistic effects and a more precise interpretation made by the Boutorini Codex – a heron devouring a snake, now San Pedro and San Pablo are the guides every year. The festival is colorful and unique. 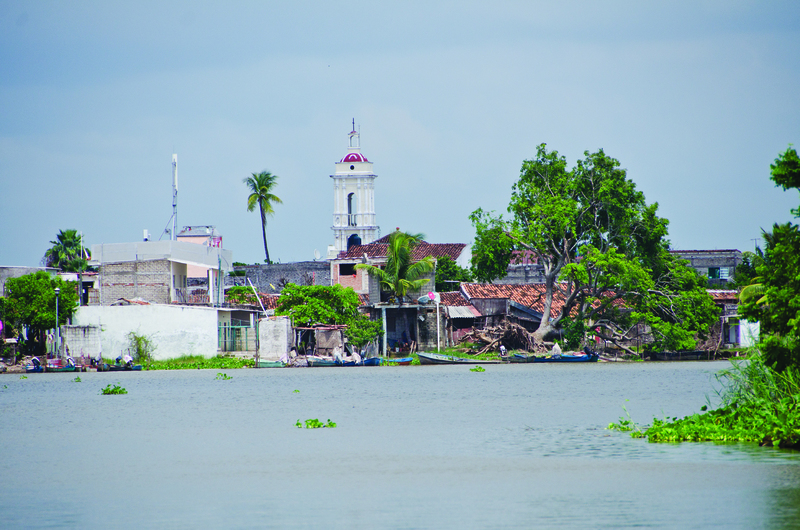 Shrimp-fishing characterizes this region, which is known as the ‘Venice of Mexico’, and the Saints sail out very early, followed by a procession of parishioners from around the island to bless the waters so that the traps they’ve set get as close as possible to the three ton record per night that was set in the past. The mangroves create the shrimp’s habitat and provide the material to build an elaborate levee system that have been used for fishing since immemorial times, while a shorter-than-usual mass is celebrated. This is followed by a battle, and the whole town is split up in two teams, each one representing one of the two saints, who compete on a race throughout the island, followed by a pagan celebration. Each team will chose their best sailors for the race, who will compete on board of enormous canoes carrying the image of their respective saint. They’ll circle around Mexcaltitan, propelling the canoe with sticks that are submerged to the bottom of the channels, just like they do in the trajineras in Xochimilco, and not with paddles like it’s done in the rest of the country. Every year, San Pedro’s team will invariably win. “No, we’re not cheating. It’s just that San Pedro is even more miraculous and it’s better to commend fishing to him, as we don’t want to annoy him. The strongest contenders are always placed in San Pedro’s team, and this is why he always wins… but we’re not cheating, the competition takes place like any other”, said Hector Apodaca, a guard at the Museo del Origen, which was built on this island to celebrate its designation as Cradle of Mexican culture. The joy, cheering and festive environment that surrounds the races is only the beginning of a party as traditional as any, which includes dancing and eating, as well as fireworks during the night, but more importantly, framed by a natural environment of incomparable beauty. Mexcaltitan is located 21 miles northeast of Santiago Ixcuintla, approximately 1 hour from San Blas and 2 from Tepic. From Santiago Ixcuintla you must take the road towards Sentispac, and continue on towards the La Batanga pier, where you’ll have to take a boat to the island. Eating at Mexcaltitan is a whole new experience. This is the place that gave birth to the original recipe of the ‘cockroach shrimp’, and in no other place can they be found as crunchy, the ideal snack to go along with a beer. Fish in the zarandeado style, shrimp tamales, shrimp pate and aguachile from Nayarit complete the feast. It’s recommended to sleep in San Blas when visiting Mexcaltitan, as the travel to and from the island can be made with ease. In San Blas, one can find a room in comfortable hotels like Garza Canela, Hacienda Flamingos and Casa Mañana, among others.